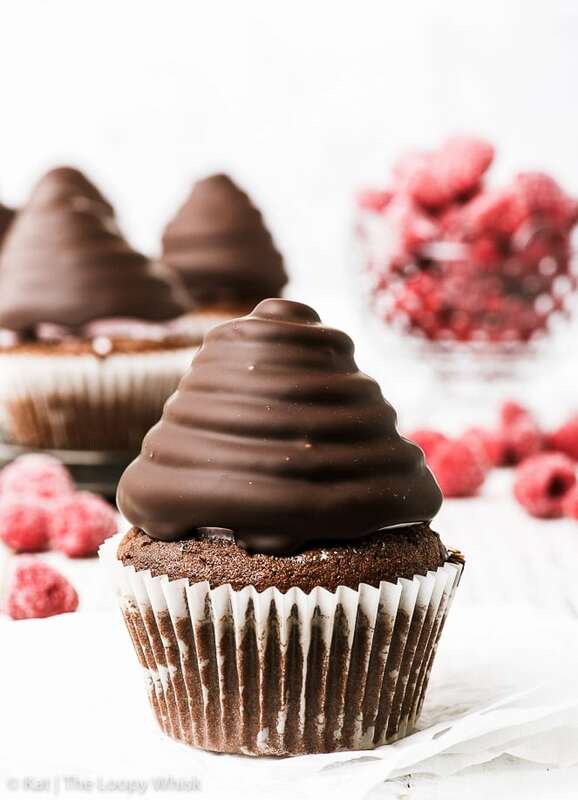 Making these chocolate-covered raspberry hi-hat cupcakes is like creating art. 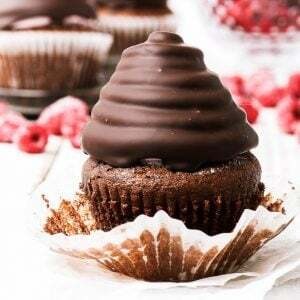 A thin, gently crunchy dark chocolate shell covers a fluffy cloud that is the raspberry-flavoured marshmallow meringue, and moist gluten free chocolate cupcakes complete what is essentially a piece of cupcake heaven. You know those days when everything that could go wrong does go wrong? When an important e-mail ends up in the junk folder, a request is denied and a friend is feeling poorly in a really scary way? Yeah, it’s been one of those days. I don’t deal well with days like that. I don’t deal well with stress in general. I bet I’m not the only one – more like one among many. Writing helps. Putting thoughts to paper, just getting it all out of your system. Baking, too. Being productive in that most delicious of ways. And breathing. Important, that one. Breathe in. Breathe out. Listen to a song that reminds you that what’s happened… happened and it’s not the end of the world. Breathe. And it’s really really not the end of the world. I know it may sometimes feel like that… but it really isn’t. Just breathe. We’re okay. 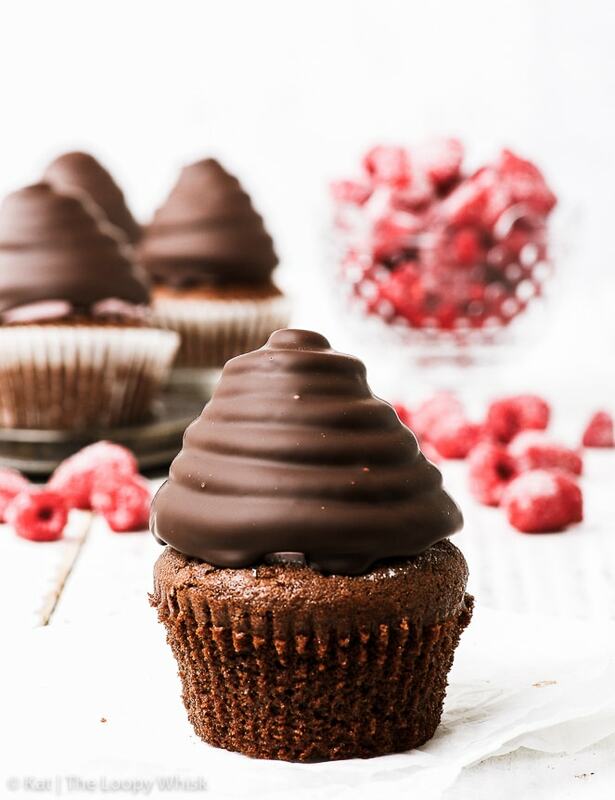 And if your heart is still fluttering for all the wrong reasons… pop into the kitchen and dip some cupcakes into chocolate. It’ll help, you’ll see. Chocolate makes everything better. 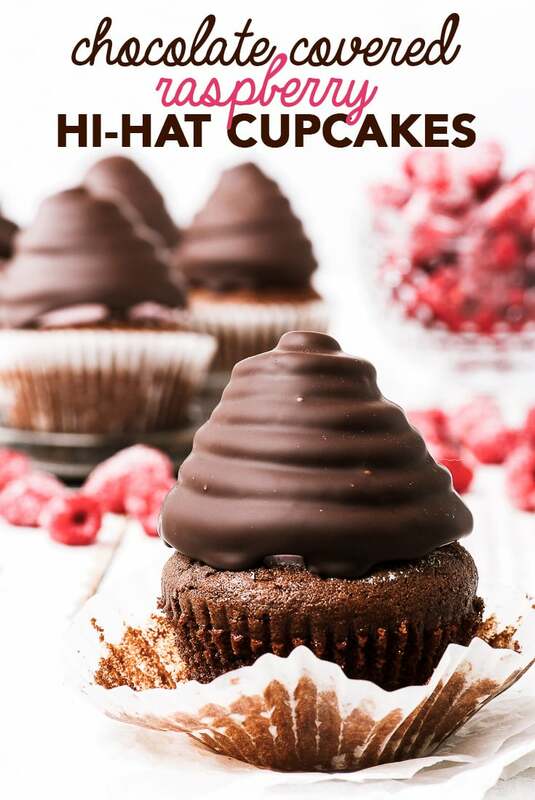 Hi-hat cupcakes are an ingenious thing. They come in many different variations, but I went with a twist on the most commonly encountered theme: chocolate cupcakes topped with marshmallow-like Swiss meringue frosting, which is then dipped into luscious dark chocolate. Only I went a step further by flavouring the Swiss meringue with a raspberry reduction, which gives it the most pretty light pink colour. Can we all agree that the raspberry-chocolate flavour combo is spectacular? Yeah? But it’s not just the flavours that have me in love with these hi-hat cupcakes. It’s their texture. When you bite into them, you first encounter the thin, gently crunchy dark chocolate shell, which gives way to the fluffy cloud that is the raspberry-flavoured marshmallow meringue. And then, at the end, you come to the flavourful, moist (gluten free, obviously) chocolate cupcake… Heaven. 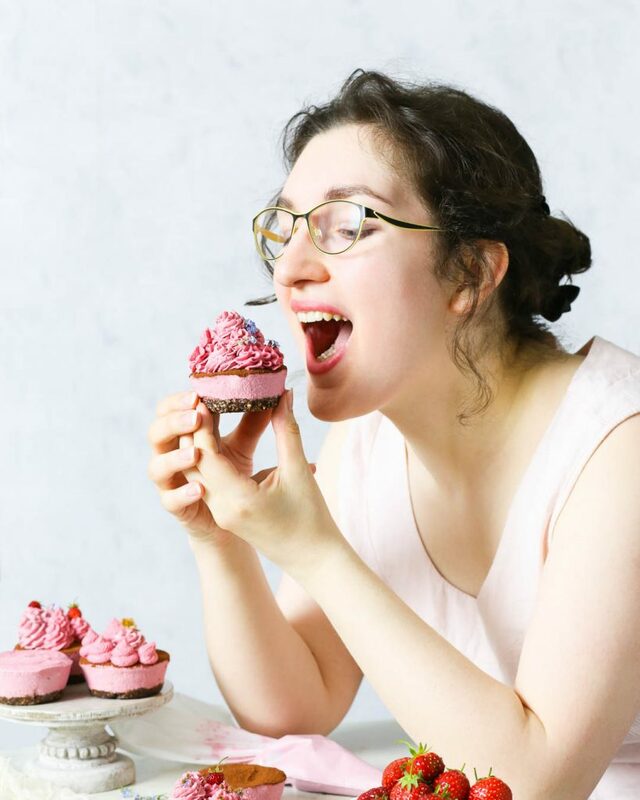 And making them, piping the fluffy pink frosting onto the cupcakes, dipping them into dark chocolate, watching the excess chocolate drip away… and then staring at the dark chocolate as it slowly goes from shiny to matte as it firms up… it’s like watching art being created. I hope your everything-went-wrong-days are few and far between. 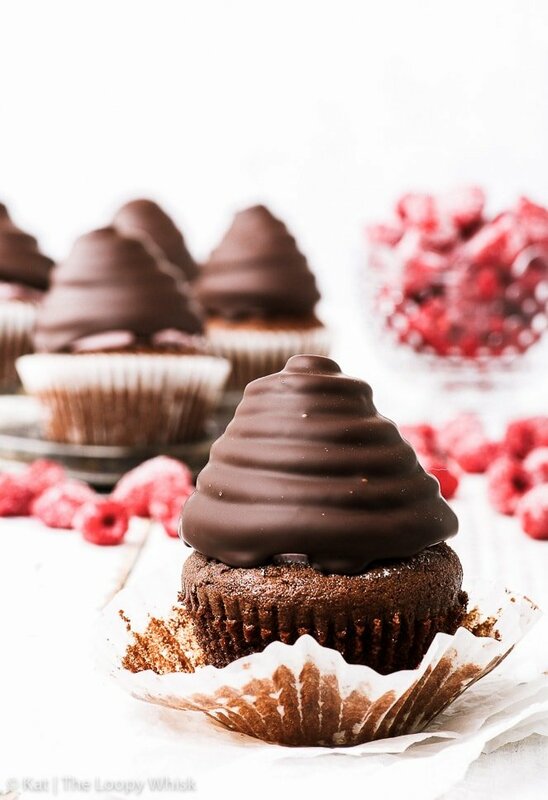 But when they happen, and they inevitably will, just remember to breathe, put on some music, and go make some chocolate-covered hi-hat cupcakes. Pre-heat the oven to 355ºF (180ºC) and line a 12-hole cupcake tin with cupcake liners. 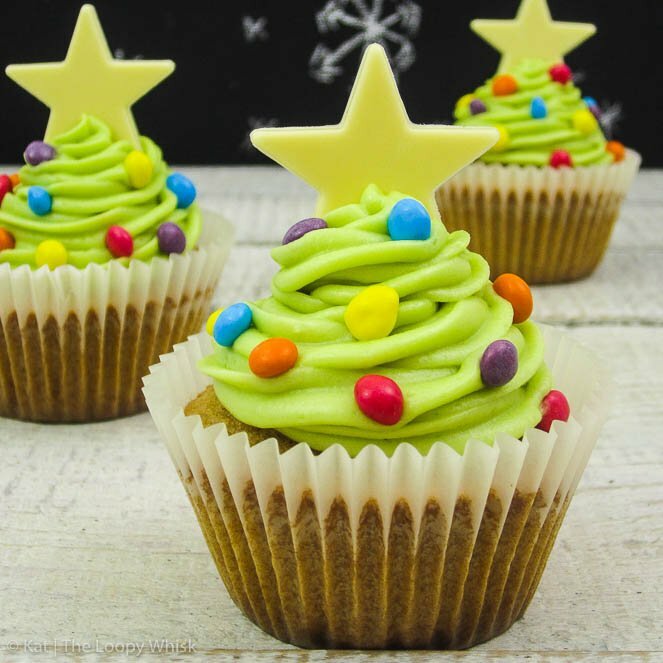 If you're worried about your cupcakes sticking to their liners, brush the insides of the cupcake liners with some vegetable oil or melted coconut oil. In a bowl, cream together the softened unsalted butter and granulated sugar. Sift together the gluten free flour, cocoa powder, salt, xanthan gum, baking powder and baking soda, and add them to the butter+sugar+egg mixture. Mix well until there are no flour clumps. 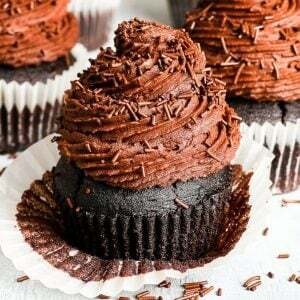 Add the instant coffee + milk mixture, and stir well until you get a smooth cupcake batter. 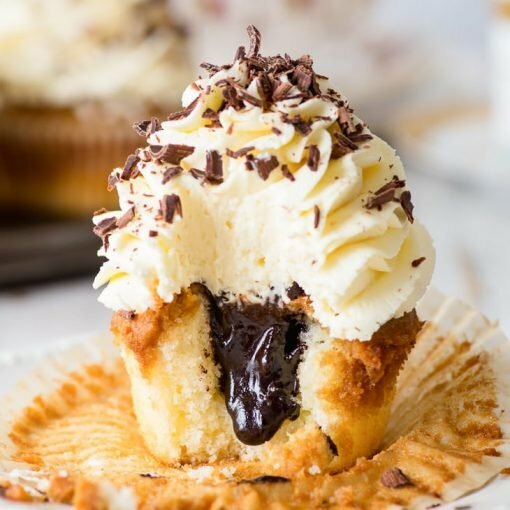 Using a spoon or ice cream scoop, transfer the cupcake batter into the cupcake liners so that each liner is ~2/3 - 3/4 full. 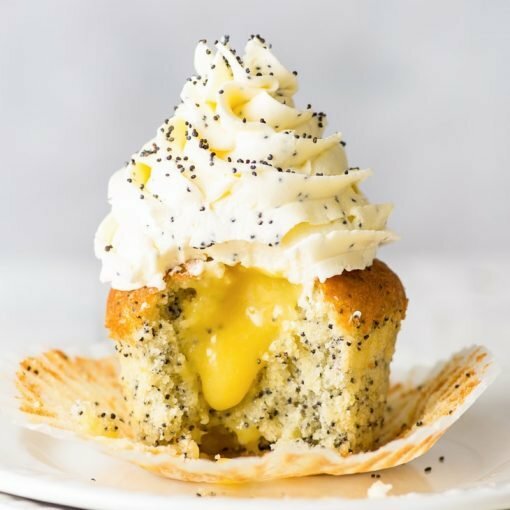 Bake in the pre-heated oven at 355ºF (180ºC) for 20 - 22 minutes until an inserted toothpick comes out clean and the cupcakes feel springy to the touch. Return the raspberry juice to the saucepan and cook further until it has decreased in volume to about 4 tbsp. Mix the egg whites, granulated sugar and cream of tartar in a heat-proof bowl, and set the bowl above a pot of simmering water. Heat the meringue mixture with constant stirring until it reaches 150ºF (65ºC) and the sugar has melted. Heating the egg whites to this temperature makes them safe for eating. 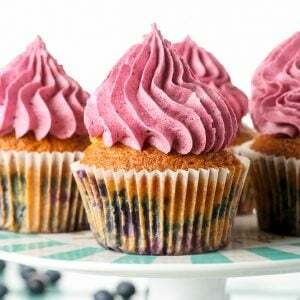 Add the cooled raspberry reduction and mix briefly until you get a fluffy frosting with an even light pink colour. 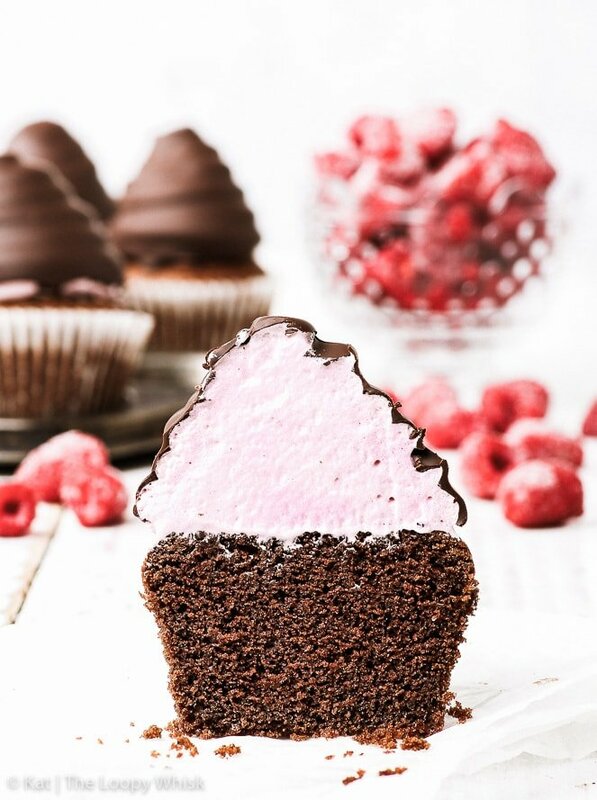 Using a piping bag and a big round nozzle, pipe the raspberry Swiss meringue on top of the cooled chocolate cupcakes. 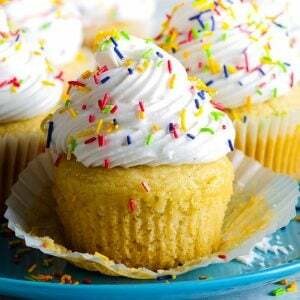 Freeze the cupcakes for 15 - 20 minutes. In the mean time, melt the dark chocolate together with coconut oil, and transfer the melted chocolate into a mug. The mug should be deep enough so that you can dip all of the frosting into the melted chocolate at once. Note also that 7 oz (200 g) chocolate is more than you'll actually need (you'll have plenty left over), but you need that amount to be able to dip the cupcakes properly. Dip the frosting part of the chilled cupcakes into the melted chocolate, allow any excess to drip away and allow the chocolate to set. 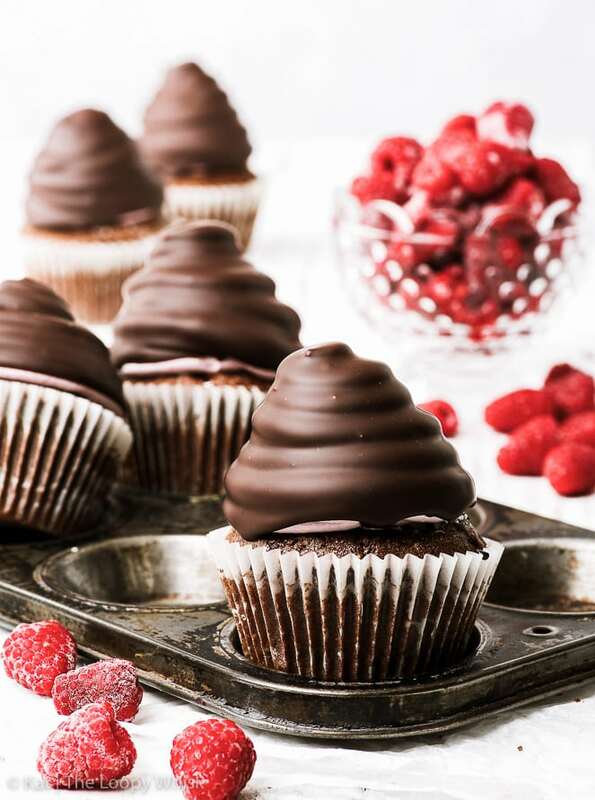 The chocolate-covered raspberry hi-hat cupcakes keep well in a closed container in a cool dry place (even a fridge!) for 3 - 4 days. 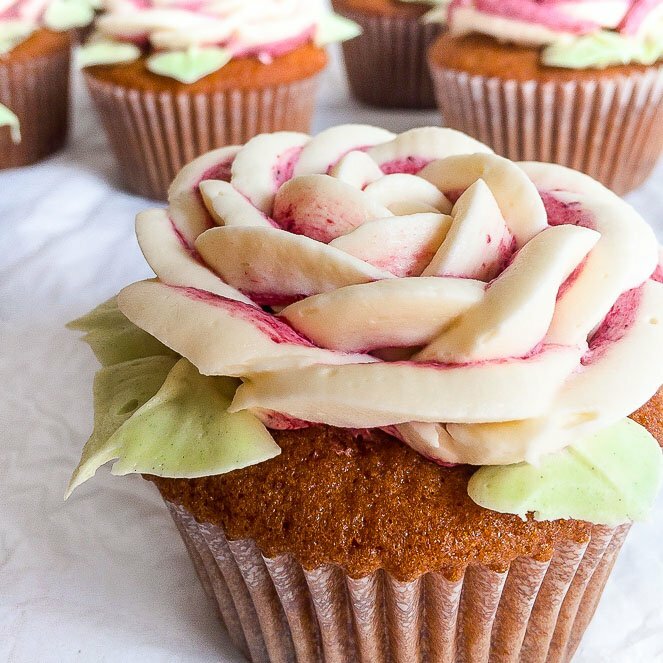 Looking for more cupcake awesomeness? You’re definitely in the right place!